When I first got this book I expected it to be about alternatives to the camera app…or about how to take great photos with an iPad. This book is neither. This is a book for experienced photographers adding the iPad into their toolkit. The book covers advanced photo editing programs as well incorporating the iPad into their routines. The first chapters cover how to use an iPad to assist with your current process such as storing photos, backing them up and using them to control your advanced camera. Other chapters cover apps for editing, rating and tagging photos as well as videos. Even though I’m only a novice photographer, the tips and tricks in this book are invaluable for anyone who wants to shoot photos on the road but not take a whole laptop with them. The chapter on building an iPad portfolio and sharing photos was really valuable to anyone who wants to show off their digital work and includes very specific suggestions of apps and processes. Finally, the last chapter covers a list of apps that photographers would use on location, in the studio and on the road. 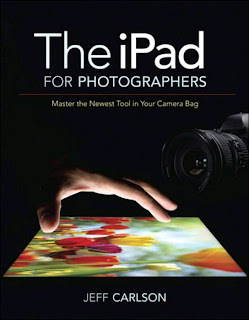 If you are looking for a book on taking photos with the iPad, this isn’t for you, but if you want to use your iPad along with your digital camera to make your photos even better this book is for you. The writing is crisp, clean and direct (though some of it went over my head). In this post for GigaOM/TheAppleBlog I examine iOS 6 Apple Map alternatives. In this also very popular post for GigaOM, I examine Google's Fiber equipment and setup.